There are certainly many reasons why Hulk Security Systems should be your choice for providing the best in professional security services. From intercom systems to CCTV systems to home security systems and more, we have established a firm reputation for providing prompt, professional and effective services to fulfill your security needs whether you run a skyscraper or just have a small home that needs effective protection. What is Hulk Security Systems? Our focus is to take care of the security needs of the businesses and residents by using the best in security system measures. We understand that our name evokes that of a famous Marvel Comic superhero of great strength and determination. Our services are backed by professional, experienced security technicians who never stop in their quest to provide the best in security services. We take pride in providing the best in security systems designed for the home, office or facility that provides the best for your security needs. License, Bonded & Insured: This means that we follow all the laws, rules and regulations to provide for you the best in security services. Plus, if something unexpected should happen when we are on your property, our insurance will take care of the damages. This is what we provide to you that brings peace of mind when installing a new security system. Free Estimate: We provide a free estimate of our services so that you know upfront exactly what you will need to budget to provide effective security for your home or business. There are no hidden fees or surprise costs because we want you to have all the information so that you can make the best decision for your needs. 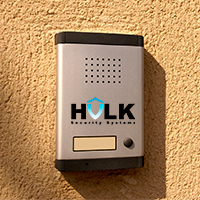 Total Approach: Hulk Security Systems offers more than just alarms. We provide a complete security system for your home or business. This means identifying potential weaknesses, installing new locks and ensuring that all avenues of intrusion are covered. Advanced Security Systems: We use the latest in reliable, technically advanced access control systems that are designed to protect your property. We use digital systems that are robust and backed by our company to provide the best for your security. This means intercom systems that are versatile, CCTV systems that provide clear images and home alarm systems that work promptly when activated. Most of all, we have built our reputation on providing the best in customer service when it comes to the purchasing and installation of our security systems. However, we understand that our reputation is only as good as the last customer that we serve. At Hulk Security Systems, we are the professionals that offer you peace of mind by providing the best in security service that offers complete protection for your home or business.